XiOptics leads the industry in providing low optical loss solutions for Plastic Optical Fiber (POF) media connectivity in harsh environments. We offer POF termini in both Mil-T-29504 and ARINC 801 configurations. Our products have been qualified in the most demanding environments. We now are the only manufacturer who has both flight certification for commercial aerospace and earth orbital functions. We developed our product using a unique endface solution to remove the possibility of micro stress cracking of the operating endface while exposed to extremely harsh vibratory environments. 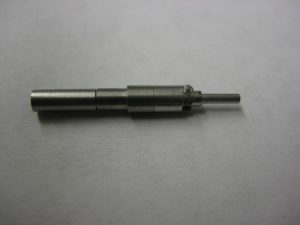 Unibody Ferrule: XiOptics POF terminus designs improve POF core concentricity by integrating the POF “ferrule” with the connector bodies. Specialized internal treatments ensure proper adhesion of POF media to the machined stainless steel ferrules. Body Materials: XiOptics uses only precision machined and passivated stainless steel for all components. This ensures compatibility with all connector platforms as well as providing users absolute surety of non-corrosive products. Compression Springs: XiOptics uses only the finest pre-set and precision ground 17 series stainless steel springs. This ensures that our products perform the same after one or a thousand mating cycles. Termination: our POF products allow for rapid and low cost termination using standard adhesive systems. These can be either UV or thermal cure. Our endface geometry ensures no long term loss degradation due to mating stresses. Our POF termini are available as size 16 contacts in an ARINC801 configuration as shown above or as Mil-T-29504 products as shown below. Product drawings and provided below and ordering of product can be made via our on-line catalog or here. This range of products gives our customers the option of a broad range of industry standard connector systems to design into their systems. Our products have passed rigorous FAA witnessed flight testing in Mil-DTL-38999 connectors, ARINC801 connectors and ARINC 600 series connectors. If termination of plastic optical fiber in harsh environments for industrial, medical, aerospace or defense systems is a needed with optical losses of less than 1 db, XiOptics can deliver. Currently our standard POF termini are design to function with ESKA POF media (1.0mm nominal media diameter). Other specialized diameters are available upon request. Please refer specialized requests to the factory specialist. To view product drawings, select a link below.